This simple to bake recipe is a great way to use up apples that might be a little too bruised or old to eat on their own. 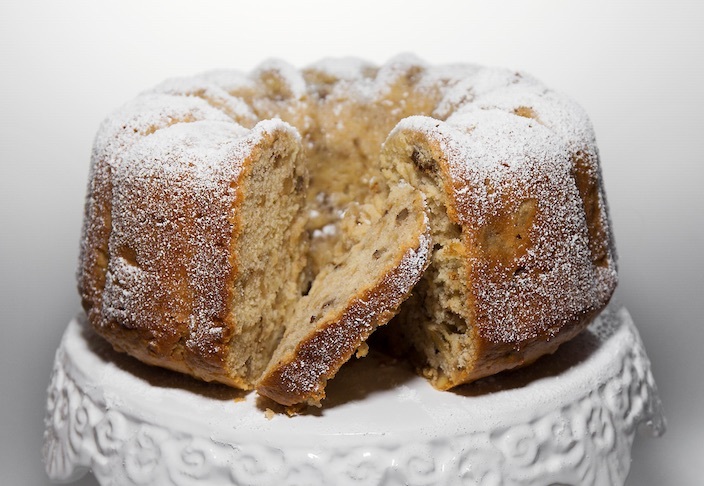 And you can choose to mix in chopped walnuts or golden raisins for an apple cake with even more texture and tastes. The apples for this cake are sliced, baked and chopped to your preferred size. 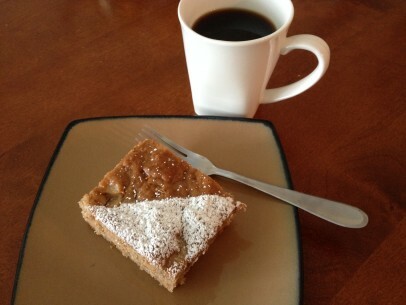 Apple cider adds another layer of yum and helps to make milopita light and airy. 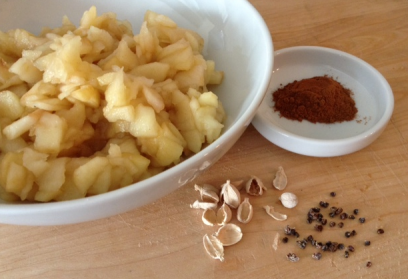 I always like to freshly grind the cardamom seeds as they bump up the flavor and are the perfect complement to apples. 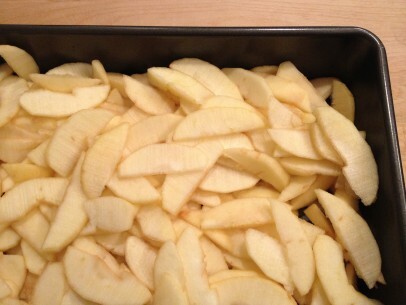 To bake your apples, just peel, core, thinly slice and layer in a baking pan. Cover tightly with foil and bake for 30 minutes at 400 degrees. To give you a good idea of what your baked apples should be, I normally use McIntosh apples and this baking method gives me apples that I can mash with a fork using just slight pressure. You can do this step ahead and keep your baked apples covered, refrigerated for 3-4 days. Mix up the ingredients according to the instructions below and you’ll have a thick, aromatic batter – feel free to lick the spoon! Spread the batter in an even layer in your baking pan. And it’s a good idea to line the pan with parchment paper. Not only does it make the cake less likely to stick but also gives you ‘handles’ to help lift the cake from the pan for faster cooling. Your milopita will bake up in about 40 minutes and should be a beautiful golden brown on top. The sides of the cake will have pulled away from the pan and a toothpick inserted will come out clean. You can cool in the pan or lift it out carefully to cool on a board or rack. And wait until your milopita is completely cooled before cutting – your patience will be rewarded, I promise! In larger bowl, mix sugar, apple cider, vegetable oil and spices until well blended. In third small bowl, gently mash cooked, sliced apples. Add apples to liquid ingredients, mix well. Add dry ingredients to wet approximately 1 cup at a time. Stir to combine well. If you’re adding walnuts, mix them in at this time. 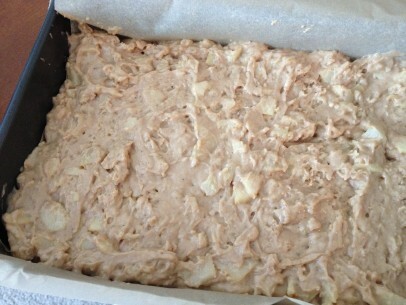 Spread batter evenly in parchment lined 9×13″ baking pan. Bake for 40 minutes at 350 degrees. You can either cool your cake right in the pan or allow cake to rest for 10-15 minutes and then remove from pan to finish cooling. Allow milopita cool completely before cutting. Dust with powdered sugar. This recipe also makes 2, 8″ loaf cakes (bake at 350 degrees for 1 hour) and the loaves freeze well for up to two months. Bundt pans make a lovely, albeit less traditional, presentation too! This recipe fits a 10″ bundt pan perfect. Just bake at 350 degrees for 1 hour and 35-40 minutes. Milopita’s in the oven now and so many aromas and flavors of Greece are filing the kitchen – breakfast is almost ready! sounds great. Is there anything you can leave out or substitute in this recipe? For example, can you swap out the apple cider for water? Hi, this is the first time I’m making this, it’s right in the oven, but I didn’t have enough material for two loaves, only one. How thick should the layer be? I’m afraid mine is too thick and won’t be baked properly. I’m European so I have to convert these things: I don’t use loafpan, but this kind of baking sheet u have in the pictures. It’s 14.8″ x 10 ” This is the second time I bake anything at all in my life, so I don’t have too much expectation. I put everything in the pan, but it was too dense. After 10 mins I noticed, I left the oil out so i took out everything, back to the big bowl, added oil, stirred in, then back to the pan :DDDD If it wont turn out good, I will give it to my father, because he eats everything, we put on the table in front of him, then I will try again. One thing is sure, it has fantastic scent! Now it’s cooling…. Thanks! You made me laugh Diana 🙂 Let me know the next time you try baking and we can do it together – once you start you’ll bake all the time! It turned out very delicious as for flavor, but I’m not sure about the consistency. Should it be dense, chewy, or fluffy or crunchy or what? Like a brownie? Mine is a bit dense, but the whole family loved it. Cardamom is very nice in it. Thank you for your amazing recipes. I’m a vegetarian (not vegan), and although your recipes are great anytime for anyone, they are an absolute blessing during religious fasting periods! Mine came out wonderfully today. Thanks for the recipe. I halved the ingredients for the 2 of us but used the same amount of apples. I didn’t have apple cider but I did have some pear cider which worked very well. I added raisins. Really light, moist and full of flavour. What flour or mix of flour would you suggest to make this recipe naturally gluten free? I tried yesterday a mixture of coconut flour, buckwheat flour and spelt flour but the liquids were not enough to make a nice batter. I did add a little more cider apple and warm water. It was pretty delicious but quite dense. I’d be grateful if you can let me know what your thoughts are. Made this today. The smell throughout the house was amazing. I added both walnuts and sultanas. Also used wholemeal spelt flour. Had to add another 1/3 cup of cider because of the spelt flour. Also added some pear. Definitely making this again. My daughter and I make this cake together. It is very simple and quick to make. The scent of it baking is wonderful, and it rarely gets the opportunity to cool down completely before the first slice is cut. The recipe makes a large cake, but it keeps beautifully in a tin for several days, and the last slice is as moist and fragrant as the first. This looks so good. I’m trying this tonight with coconut oil, pecans, an added fresh cranberries. This recipe is fantastic. 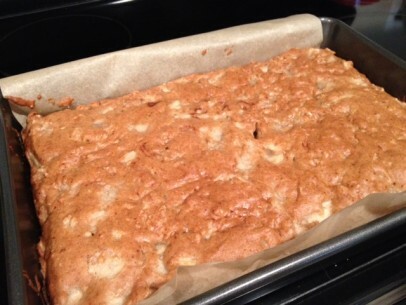 My kids have asked me to make this apple cake all the time. What kind of apples for milopit? Hi Kiki, I’m a greek descendent argentinian so… not even close to vegan. But for me, original greek recipes have way too much butter. I usually use less than required or replace some of it with vegetable oil. Your recipe sounds delicious. I’ll try it tomorrow. Hi I’m about to make this cake, you mention cup could you advise approx measurement. Also what type of flour is used. Many thanks for this can’t wait to make it, the apples are in oven, getting ready for next stage tomorrow. I normally use either all-purpose flour or white whole wheat flour. Not sure what the first part of your question is though? you will LOVE this cake!! I followed this recipe exactly (using only walnuts and no raisins), in the 9×13 pan, and it came out absolutely perfect: gorgeous, moist and delicious, thank you so much! A new family favorite! Hi, I made this recipe and it came out really well. I’m in the UK and our cup sizes may be different from the US. So I used less flour than the recipe called for. Does anybody know how many ounces of flour I should use? Hi again Kiki, thanks for your reply. Making a double batch tonight, and tried out the conversion table which helped. Made this for a multicultural day at my daughter’s school (she’s 1/8 Greek!) it was delicious and a bonus to be able to offer something the vegan families could eat. Why no Granny Smiths, out of interest? That’s what I tend to have in the house.